An Evening of Indian Dance - Who Is My Neighbor? Inc.
$10 per adult and $5 per child (1 year old – high school). Refreshments on sale throughout the evening. This event supports the local, community-based programs of Who Is My Neighbor. An evening of Indian dance featuring Indianica Academy* performing classical Kathak dance, with a special audience participation Bollywood dance party during the second half of the performance! 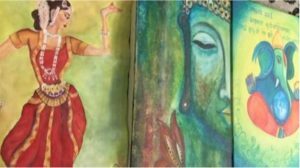 Also featuring the paintings of local artist Madhuri Magesh. Gallery exhibit on view and paintings for sale during the evening. Funding has been provided by the Gateway to the Arts program, through a grant from Johnson & Johnson, and administered by Middlesex County. *Indianica Academy: Beware of the talent that hides within you, for it is like a slow smoldering spark waiting to be kindled into something warm, bright and beautiful. Indianica Academy is at the forefront of bringing South Asian Performing Arts to America. In particular to the residents of New York and New Jersey, who wish to experience our culture first hand. When we say first hand we do actually mean first hand. We offer simply the best culturally accurate Kathak dance instruction in the USA, (from non other than Ms. Padma Khanna). We also offer Bollywood, Indian Folk Dances, Western pop, Bollywood Fusion, Hip Hop, and Ballroom Dances too. When you join us, either as an ongoing student of the art form or as a complete novice wanting to learn from the ground up, we welcome you. We came from humble beginnings and we will always stay humble. Our purpose is to be inclusive. Our Academy is really YOUR academy. We want you to jump in and immerse yourself in the beauty and majesty of our culture.